Riva has released new pictures of its new flagship, the Riva 122 Mythossuperyacht, currently under construction and on track for delivery. 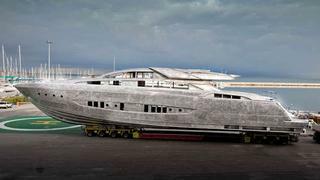 At 37m, this is the largest yacht ever produced by historic Italian yacht builder Riva, and it will be its first ever constructed completely in light aluminium alloy. The Riva 122 Mythos is currently under construction at the CRN shipyard in Ancona, Italy. CRN and Riva are both part of the Ferretti Group, and the build represents the long-standing partnership between the two brands, which dates back to 1970. Riva celebrated its 170th anniversary in 2012 and custom superyacht builder CRN turns 50 this year. Inspired by Riva's 86 Domino, the design of Riva's new 122 Mythos superyacht is a collaborative effort between Mauro Micheli and Sergio Beretta of Officina Italiana Design, who designed the whole of the current range of Rivas, Ferretigroup Engineering and Advanced Yacht Technology & Design Center – Ferretti Group's in-house research center. Built for a Brazilian owner, hull No 1 of the Riva 122 Myhtos superyacht will feature the optional three-cabin layout to offer optimal spaciousness and private accommodations for owner and guests. The Mythos is also available in a standard four-stateroom version proposed by Riva and a layout with five staterooms. The open plan main saloon and dining area will feature Calnetto walnut wood, soft leathers and chromium-plated steel. The engines have just been installed on the new Riva 122 Mythos, as seen in the picture above. The planing-hull yacht will be powered by twin MTU 12V 400 M93L, providing a max speed of 27.5 knots and a cruising speed of 25 knots. Riva estimates that 15,000 man hours will go into painting, 10,000 man hours will go into her carpentry work and 8,000 hours for electrical systems in the construction of the Riva Mythos. The new flagship superyacht is currently on schedule for its launch date of February 2014 and a delivery scheduled for April 2014. She will spend spring and summer 2014 in the Mediterranean before heading off to Brazil.